Thermometers will hit 90 for all but far North Jersey on Thursday, with heat index values topping 100 degrees for most of the state. Here we go, New Jersey! For the past few days, we've battled "run-of-the-mill" summertime heat and humidity. But for Thursday, our heat wave kicks up a notch. Record high temperatures will probably remain safe. While it will be the hottest day of 2017 so far, we we had at least 5 days hotter in 2016. Regardless, Thursday is going to be quite uncomfortable and downright dangerous if you don't take care of yourself. Morning temperatures are just stifling, mostly between 75 and 80 degrees. Yuck. With such a warm start, thermometers already have a headstart in their climb to the 90s by Thursday afternoon. Our high temperature forecast for Thursday ranges from 86 (North) to 97 (SW). Dew points statewide should peak between 68 and 74. Doing the math, that puts the heat index (the "feels like" or "apparent" temperature) between 97 and 107. You know the drill... Dress for the hot, humid weather. Stay extra hydrated. Take frequent breaks. Air conditioning is your friend. Don't leave any living thing (kids, pets, etc.) in a car for even a minute, as interior temperatures will soar to 140 degrees during the heat of the day. --An Excessive Heat Warning from 11 a.m. to 8 p.m. Thursday, for the Philadelphia metro area (northwestern Burlington, Camden, Gloucester, and Mercer counties). --A Heat Advisory until 6 p.m. Thursday for the New York metro area (eastern Bergen, eastern Essex, Hudson, and eastern Union counties). 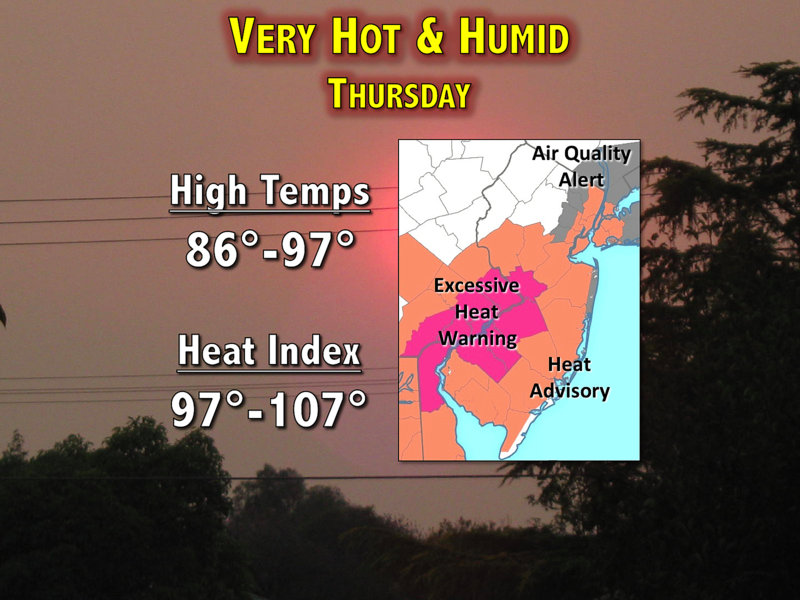 --A Heat Advisory from 11 a.m. to 8 p.m. Thursday for the rest of the state, along and south of Interstate 78 (Atlantic, southeastern Burlington, Cape May, Cumberland, Hunterdon, Middlesex, Monmouth, Ocean, Salem, and Somerset counties). --An Air Quality Alert (Code Orange) for Thursday along the New Jersey Turnpike corridor (Bergen, Burlington, Essex, Hudson, Mercer, Middlesex, Monmouth, Passaic, and Union counties). Luckily, Thursday is not only the peak of the heat wave, it's also the grand finale. A cold front will slowly approach New Jersey late Thursday, firing off an extended period of showers and thunderstorms. First raindrops look to push into the northwestern corner of NJ around early Thursday afternoon, pushing south and east by late Thursday afternoon. Don't expect much relief from these showers and thunderstorms — it's still going to be ridiculously humid. Additional showers are expected Thursday night. Following a possible lull Friday morning, another push of thunderstorms will turn up Friday afternoon through evening. We'll have to be on the lookout for some stronger storm cells, containing strong winds and hail. In addition, heavy downpours are a sure bet, given our "juicy" atmosphere. The rain and transition to a new air mass makes Friday's temperature forecast challenging. I think we'll see a wide range of high temps to close out the workweek — one of those "tale of two Jerseys" kind of days. North Jersey might get stuck close to 70 degrees, while steamy South Jersey once again soars to near 90 degrees. Bottom line: the weekend forecast still looks great! All rain should end across New Jersey by 5 a.m. Saturday. Residual clouds should then clear out, leading to mostly sunny conditions by lunchtime. Humidity levels will drop slightly, as dew points fall from the 70s to the 60s. Not enough of a drop to call it "dry" or "comfortable", but the difference should be noticeable. High temperatures on Saturday are forecast to reach the seasonable lower to mid 80s. Sunday will also feature abundant sunshine, manageable humidity, and warm temperatures. Highs will climb into the mid to upper 80s to close out the weekend. Our next chance for showers will be Monday into Tuesday, but no washouts are expected. Temperatures look to stay at or above normal for the foreseeable future.